It’s often surprising just where exactly asbestos can be found in older homes and what needs to be done to ensure a safe asbestos clean up. The best route is to bring in the experts. Qualified asbestos removal firms will have trained staff, who will know where exactly to look for possible uses, such as sidings, floor tiles, asbestos duct or ductwork insulation and boiler areas for instance. They will also be trained to use the correct methods, such as taping off areas with asbestos danger tape, using asbestos cleaning cloths and disposal bags or they may possibly recommend asbestos encapsulation methods for areas where the material does not need removal and is not friable but where work is needed to ensure any asbestos cannot be accidentally released. 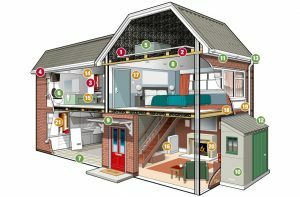 The Health and Safety Executive in the UK has produced an image that shows some (not all) of the possible places to find asbestos in the home. The numbering guide can be found on their page. The picture is linked to the page it comes from. There is an old film available that shows many of the areas where asbestos can be found in an older house. Warning: the video is actually called “how to safely remove asbestos” but what it really does is show you where asbestos is located. If you are interested in watching to see how many ways asbestos was used in older houses, then check out the asbestos documentary below.